(noun) Small cup of strong black coffee without milk or cream. a demitasse in her vintage , black with gold trim , porcelain set. The Demitasse (pronounced-"de﻿m-i-tas"), originated in France in the 1800's. Demitasse means "half-cup", due to it typically being half the size of a full coffee cup. The purpose of the smaller half cup is for drinking stronger coffee's such as espresso, cappuccino & Turkish coffee, typically served after dinner. 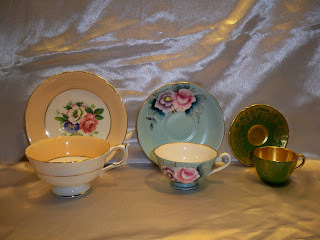 The Demitasse cup & saucer is the next size in the cup & saucer family (middle in the picture, also referred to as a "Demi cup" or "Child's size" cup & saucer). Today's average cup measures approximately 2-2 1/2" tall & the saucer measures approximately 4- 4 1/2" in diameter. (verb) Remove completely from recognition or memory. 1. erase (a mark) from a surface. plaques that are Confederate related. (verb) Reduce to small pieces or particles by pounding or abrading. on to the lawns and driveways of many homes. (noun) An expression of sympathy with another's grief. who had passed away that day. (adjective) Inclined to keep one's thoughts, feelings, and personal affairs to oneself. Usage: She was so reticent about her personal life that even her roommates did not know she had a boyfriend. most important priorities of the day , and for the year. Usage: Even he is unable to withstand the soporific influence of the place, and is gradually falling asleep. A purring cat has a calming and soporific effect on people and animals. (noun) A woman's very brief bathing suit. Definition of two-piece suit. : a suit consisting of a jacket with matching pants or a jacket with a matching skirt. matching light purple paisley accessories. (adjective) Being a part of general human experience; ordinary. (noun) Inability to see clearly in dim light; due to a deficiency of vitamin A or to a retinal disorder. family or health restrictions such as nyctalopia.